¶ 10 Leave a comment on paragraph 10 0 Chellappa, R. K. & Gupta, A. (2002). Managing Computing Resources in Active Intranets. International Journal of Network Management. 12(2), pp. 117–128. ¶ 11 Leave a comment on paragraph 11 0 Cohen, M. & Riehl, M. (1989). The effect of distant audiences on students’ writing. American Educational Research Journal, 26(2), pp. 143–159. ¶ 12 Leave a comment on paragraph 12 0 Dillenbourg, P. (1999). What do you mean by collaborative learning? In: Dillenbourg, P. (Ed.). Collaborative-learning: Cognitive and Computational Approaches. Oxford, UK: Elsevier, pp. 1–19. ¶ 13 Leave a comment on paragraph 13 0 Dillenbourg, P. & Hong, F. (2008). The mechanics of CSCL macro scripts. International Journal of Computer-Supported Collaborative Learning, 3(1), pp. 5–23. ¶ 14 Leave a comment on paragraph 14 0 Döbeli Honegger, B. (2007). Wiki und die starken Potenziale. Unterrichten mit Wikis als virtuellen Wandtafeln. Computer und Unterricht, 66. S. 39–41. http://beat.doebe.li/publications/2007-doebeli-honegger-wiki-und-die-starken-potenziale.pdf [Abruf am 01.06.2013]. ¶ 15 Leave a comment on paragraph 15 0 Döbeli Honegger, B. & Notari, M. (2011). Visualizing Learning Processes Using Didactic Pro- cess Maps. In: Kohls, C. & Wedekind, J. (Eds. ), Investigations of E-Learning Patterns: Con- text Factors, Problems and Solutions (pp. 135–148). Hershey, PA: Information Science Reference. doi:10.4018/978-1-60960-144-7.ch008. ¶ 16 Leave a comment on paragraph 16 0 Guzdial, M., Rick, J. & Kehoe, C. (2001). Beyond adoption to invention. Journal of the Learning Sciences, 10 (3), pp 265–279. doi: 10.1207/ S15327809JLS1003_2. ¶ 17 Leave a comment on paragraph 17 0 Hakkarainen, K. & Sintonen, M. (2002). Interrogative model of inquiry and computer-supported collaborative learning. Science and Education, 11(1), pp. 25–43. ¶ 18 Leave a comment on paragraph 18 0 Helmke, A. (2005). Unterrichtsqualität. Erfassen. Bewerten. Verbessern. Seelze: Kallmeyer. Leuf, B. & Cunningham, W. (2001). The wiki way. Reading, MA: Addison Wesley. ¶ 19 Leave a comment on paragraph 19 0 Muukkonen, H., Lakkala, M. & Hakkarainen, K. (2008). Technology-enhanced progressive in- quiry in higher education. In: Khosrow-Pour, M. (Ed. ), Encyclopedia of information science and technology I-V. 2nd ed. Hershey, PA: Idea Group Inc., pp. 3714–3720. ¶ 20 Leave a comment on paragraph 20 0 Meyer, H. (2003). Zehn Merkmale guten Unterrichts. Pädagogik, 10, S. 36–43. ¶ 21 Leave a comment on paragraph 21 0 Notari, M. P. (2003). Scripting strategies in computer supported collaborative learning environments. Thesis. University of Geneva. http://beat.doebe.li/publications/not-from-me/thesis_notari_scripting.pdf [Abruf am 01.06.2013]. ¶ 22 Leave a comment on paragraph 22 0 Notari, M. P. (2006). 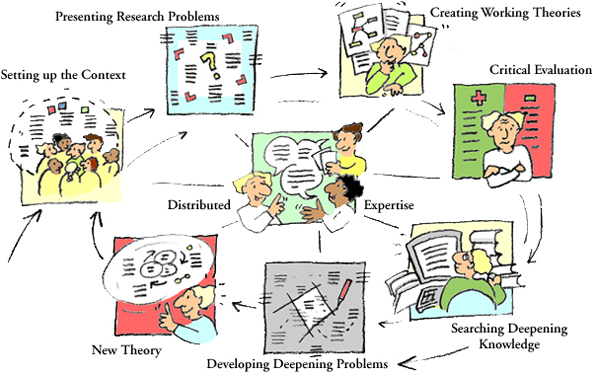 How to use a Wiki in education: Wiki based effective constructive learning. In: Proceedings of Wikisym 2006: International Symposium on Wikis Odense, pp. 131–132. ¶ 23 Leave a comment on paragraph 23 0 Notari, M. & Döbeli Honegger, B. (2007). 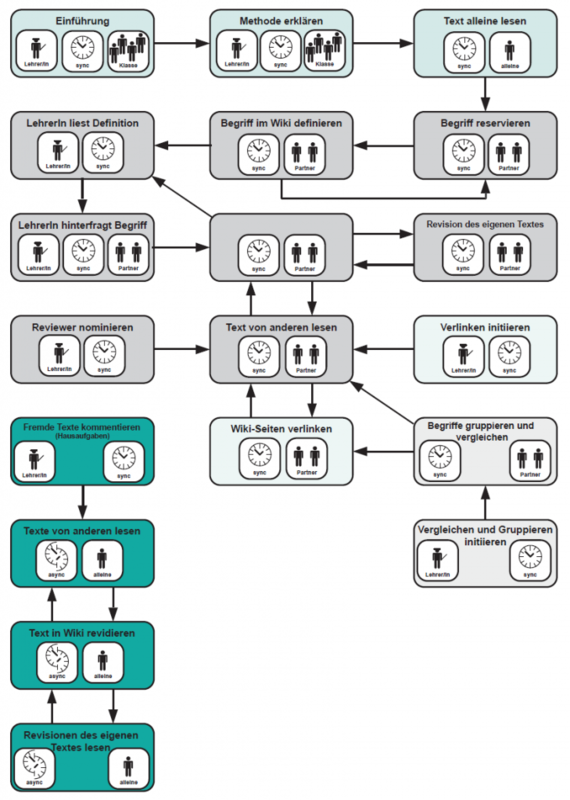 Didactic Process Map Language: Visualisierung von Unterrichtsszenarien als Planungs-, Reflexions- und Evaluationshilfe. In: Gesellschaft für Medien in der Wissenschaft (Hrsg.). Medien in der Wissenschaft. Band. 44, Münster: Waxmann. ¶ 24 Leave a comment on paragraph 24 0 Notari, M. & Döbeli Honegger, B. (2012). Wiki: an archetypical tool for collaborative learning in the digital age. In: Bocconi, S., Trentin, G. (Eds.). Wiki supporting formal and informal learning. New York: Nova Publishers 2011. ¶ 25 Leave a comment on paragraph 25 0 Panke, S. & Tillosen, A. (2008). Unterwegs auf dem Wiki-Way. Wikis in Lehr- und Lernsettings. http://www.e-teaching.org/didaktik/kommunikation/wiki/08-09-12_Wiki_Panke-Thillosen.pdf [Abruf am 01.06.2013]. ¶ 26 Leave a comment on paragraph 26 0 Wilson Ludin, R. (2008). Teaching with Wikis: Toward a Networked Pedagogy. Computers and Composition, 25(4), pp. 432–448. http://dx.doi.org/10.1016/j.compcom.2008.06.001.